Action for the River Kennet (ARK) are working with 1st Marlborough Brownies to monitor the quality of the River Kennet at Stonebridge Wild River Reserve. 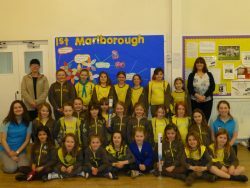 Our project officer Anna Forbes went along to meet the Brownies and present them with water quality testing kits, accompanied by Haine and Smith Charitable Trust Clerk Janet Hartwell and Marlborough branch member of staff Rachel Mabutt. The Trust has kindly funded two kits that will give ARK valuable data on the quarterly nitrate and phosphate levels and turbidity at this designated Wildlife Site and for the Brownies ARK are providing a great opportunity for the girls to get involved and cover the world and community parts of their programme. We hope the Brownies have a great time using the kits and enjoy finding out more about their local river with ARK. said Janet Hartwell from Haine and Smith Charitable Trust.